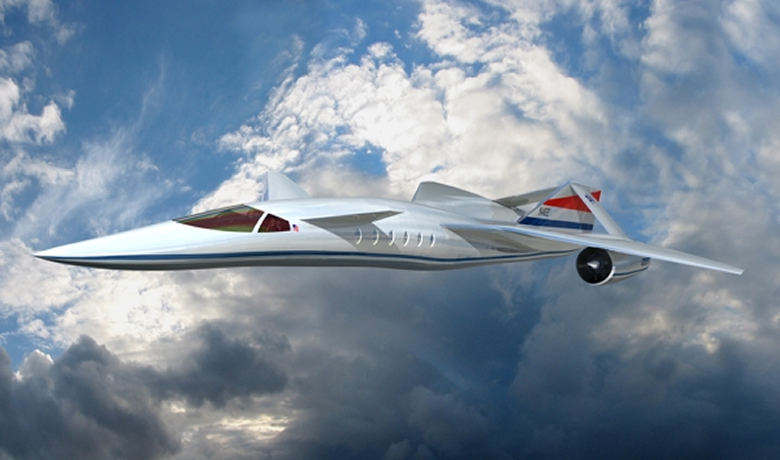 Quiet Supersonic Transport: Private Mach 1.6 Jet Travel by 2013? The supersonic jet's sonic boom will reportedly be 20dB quieter than the Concorde's, an aerodynamic trick made possible by a canceling-out effect when the plane's broad nose compresses the shockwave while the rest of the plane's fuselage expands it. Let's hope aviation authorities buy into this idea and let the thing soar coast to coast, pedal to the metal. The groundbreaking design is due to fly by 2013. You too can fly cross-country in 2 hours, that is, if you can ever get your hands on a Lockheed Martin Quiet Supersonic Transport (QSST)—a 12 person luxury plane that can hit over 1,100 MPH. But unlike its daddy, the Concord, this plane can muffle its sonic boom to 1/100 the strength. That means you won't be limited to flying over the ocean, so you can take this baby across the country without disturbing anyone. The way the QSST is able to keep itself so quiet lies in its aerodynamics. Instead of creating two large booms like most supersonic planes, the QSST is designed to create many smaller ones. (boom, boom boom, boom, boom.). The design of the QSST is futuristic: a long, needle-pointed front section with canards is followed by a relatively short cabin section. The wings are mounted at the rear in a high-wing configuration, ending with an unconventional, inverted V-shaped empennage, in the lower end of which the two engines are accommodated. This design reduces the sonic boom. The calculations and the aircraft design come from Lockheed Martin's Skunk Works, that stable of aircraft design which produced, amongst other models, the legendary SR-71 and F-117 types. With regard to the aircraft propulsion, SAI is negotiating with all three of the big engine manufacturers. On this point, the second design for a supersonic bizjet is further down the road: the Aerion Corporation of Reno, Nevada, has already decided on the Pratt & Whitney JT8D-219 engine and secured Pratt & Whitney as a project partner. 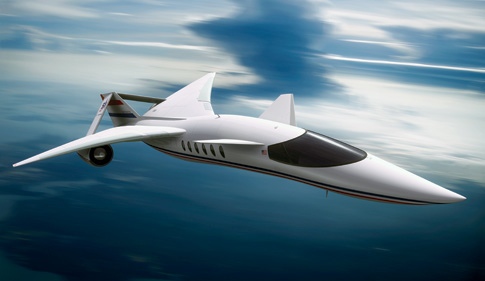 Unlike the SAI design, the Aerion supersonic jet will be able to fly over land, but only by curbing its speed. Thanks to its special shape, the Aerion jet will similarly generate only a reduced sonic boom, allowing it to fly over land at up to Mach 1.1. Over water, the twin-engined jet will accelerate to its maximum cruise speed of between Mach 1.5 and 1.6. This will mean that the travel time between New York and Paris can be shortened to four hours and 15 minutes, while the journey from New York to Tokyo can be accomplished in nine hours and 33 minutes, despite a one-hour refuelling stop in Anchorage.